What is Home Automation? It’s having the capability to conveniently and easily control the many electronic subsystems found in many homes from a single centralized integrated system. Home automation will control the home’s lighting and window treatments, home music, heating and air conditioning, security, yard irrigation, pool and spa, cameras and audio/video systems. Home automation makes life much simpler. Imagine your home monitoring the outdoor weather. When the temperature outside gets above 78 degrees, it lowers the blinds, turns on the central air and may even turn the lawn sprinklers on. Imagine pulling into your driveway at night alone, you can press a button on your phone and the lights in the kitchen, stairway, hallway, front, back and side entrances come on. No more walking into a dark house with packages in one hand and keys in your other and using your elbow to turn the light switch on! Imagine at your bedside, pressing a button that will make sure the garage door is closed, the alarm is set, and the heat is lowered. The lights in your house turn off with the exception of the front porch and driveway. It leaves the upstairs hall lights on real dim, just in case the little ones wake up in the middle of the night. With home automation and TechLife Media Systems the possibilities are endless. The benefits of an automated home are only limited by your imagination. 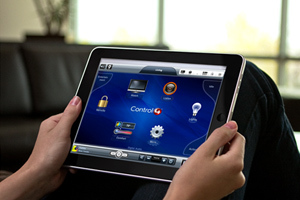 Home automation is all about comfort, convenience and energy savings to enhance your lifesytle. It’s your home….control it. Copyright © TechLife Media Systems All Rights Reserved. Designated trademarks and brands are the property of their respective owners.